Some of the released art for Blackstone Fortress by artist Paul Dainton is incredible. The new Games Workshop boardgame, Warhammer Quest: Blackstone Fortress is the third in the current series of Warhammer Quest boardgames, that started with Silver Tower back in 2016 (sadly now unavailable from GW themselves), and continued with Shadows Over Hammerhal in 2017 (with the original Warhammer Quest released back in 1995). Out this weekend, Blackstone Fortress marks a departure as it is set within the Warhammer 40k universe of the far future, as opposed to the Age of Sigmar fantasy setting of the previous two sets. Games Workshop has indicated that the game will be supported with expansions over the forthcoming years. Like Kill Team: Rogue Trader before it, there seems to be a clear effort by the design team to push and expand the Warhammer 40k background into hitherto unseen areas. For longtime fans, this is great to see, as the 40k setting holds so much potential for narrative/roleplay gaming beyond tabletop wargaming. 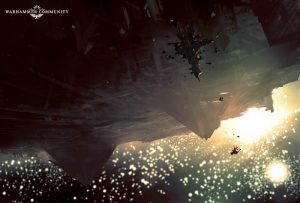 The heroes each have a ship, which they can dock at the Precipice space station between expeditions to trade any loot recovered from their adventures within the Blackstone Fortress, and upgrade their characters. The hostiles of Blackstone Fortress. The hero miniatures are stunningly crafted, as are the hostiles. There are renegade Imperial guardsmen, beastmen, Rogue Psykers, Chaos Space Marines, renegade mechanicus cultists, Ur-Ghuls (nightmarish monsters carried over from the Drukhari/Dark Eldar range), and Spindle Drones, indigenous machines to the fortress itself. Like Silver Tower, the miniatures in Blackstone Fortress have been created specially for the game. And like Silver Tower, the miniatures give a good indication of what is to come next from GW; when Silver Tower came out, we saw the rejuvenation of the Tzeentch range with Tzaangors and Kairic Acolytes. In Blackstone Fortress, we can see a heavy lean towards Chaos forces. 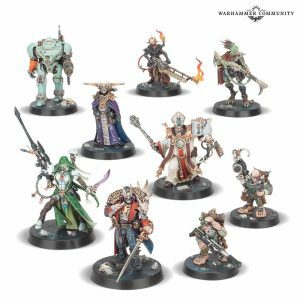 The rumour mill abounds that 2019 will see major releases for the Chaos ranges in both 40k and Age of Sigmar. 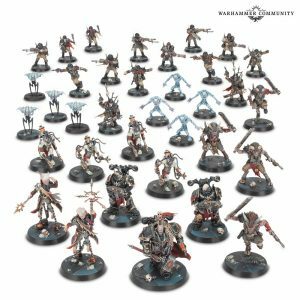 From the Blackstone Fortress set it is not hard to conclude that we will see new Chaos Space Marines, a traitor guardsmen range, a renegade mechanicus range, but also a Rogue Trader faction range and perhaps even a revamping of the Aeldari and Kroot ranges, perhaps more. 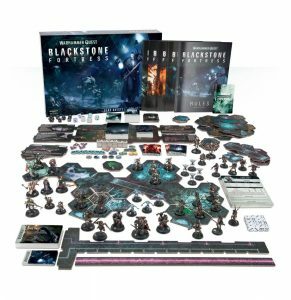 As per Blackstone Fortress itself, the game comes with five booklets; Background, Rules, Combat, Precipice (bringing RPG elements to the game aboard a space station between expeditions), and Datasheets (to use the models in 40k). I’ve seen some opinions on various forums extolling the pros and cons of having so many separate booklets, but initially it appeals to me, although how useful they will be in the heat of the game remains to be seen. Maybe one rulebook with indentations for each section might have been more player-friendly but perhaps more costly to produce. The Hidden Vault envelope that is intended to be opened once the game has been completed. Unlike Silver Tower and Shadows Over Hammerhal, Blackstone Fortress appears to not be played out over a set ‘Quest’ map. 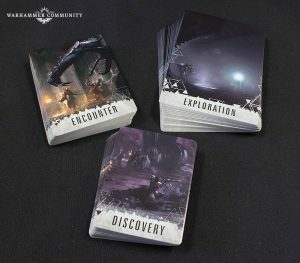 There are three sets of cards that power the gameplay; Discovery, Encounter and Exploration, and through the turning of these, the game progresses, with combat and challenges. The hex map tiles are laid out for combat, and characters have the opportunity to fight through the hostile hordes inhabiting the fortress to discover clues that will lead them deeper within the mysterious space station. If the characters discover 4 clues this leads them to a Stronghold. There are a sequence of these strongholds to overcome, leading to a hidden vault, represented by a sealed envelope provided in the box; now, depending who you believe, each envelope contains an exclusive something-or-other that furthers the plot, and will vary between box sets. 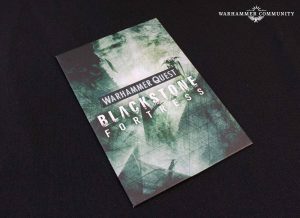 I suspect we will get a preview of a forthcoming expansion to Blackstone Fortress (GW have promised that the game will be supported for years to come), or an exclusive mission or similar. Whether or not us happy punters have the discipline to NOT open that Hidden Vault envelope before completing the initial game is another matter. The three card decks used within the game. I don’t think it is a coincidence that Blackstone Fortress is released just before the Vigilus Weekender kicks off (Saturday 24th to Sunday 25th November at Warhammer World). The most recent two 40k box sets, Tooth and Claw, and Wake the Dead, released this autumn, are set on Vigilus, as was the Kill Team starter set, released back in the summer. Games Workshop are teasing more developments in the ongoing story of the beleaguered hive world of Vigilus, to be revealed in seminars over the weekend. If we don’t see the reveal of a Primarch and/or a new box set and/or faction range I will be very surprised. Warhammer Quest: Blackstone Fortress is up for pre-order now, from Games Workshop themselves, and slightly cheaper from various hobby shops and third-party online retailers. Over on Warhammer Community they state that the game is set for release on Friday 23rd November, or ‘Blackstone Friday’. And check out the slick Blackstone Fortress website, for a thorough introduction to the game. All photos taken from the Games Workshop and Warhammer Community website.